Home » anthropology » Why are we taking the super out of the supernatural stories: another postmodern symptom? Why are we taking the super out of the supernatural stories: another postmodern symptom? Why are we taking the super out of the supernatural stories: is this just another postmodern symptom? There has long been a casus belli of modernism and postmodernism to try to explain the religious, spiritual and supernatural, to find the rational explanation for events. While there is nothing new in this observation, it is however, interesting to observe the evolution of story tellers that are weaving tales in 21st Century popular culture. ‘…. Principally there are no mysterious incalculable forces that come into play, but rather that one can, in principle, master all things by calculation. This means that the world is disenchanted’. ‘Modern societies are therefore by definition societies of constant, rapid, and permanent change. This is the principal distinction between “traditional” and “modern” societies. Modernity, by contrast, is not only defined as the experience of living with rapid, extensive, and continuous change, but is a highly reflexive form of life ….’. It’s somewhat disconcerting that many academics that write about postmodernism start off with the caveat that postmodernism is next to impossible to define. It’s this type of ephemeral dialectic that has left it as a signifier of the arcane; the near ultimate trump card of the journey-man philosopher. ‘We are now in the process of wakening from the nightmare of modernity, with its manipulative reason and fetish of the totality, into the laid-back pluralism of the post-modern, that heterogeneous range of lifestyles and language games which as renounced the nostalgic urge to totalize and legitimate itself’. David Harvey observed that postmodernity privileges heterogeneity; the result of this is a discourse which is increasingly characterised by fragmentation and indeterminacy. Leaving many with the shortcut that if it is confusing, it must be postmodern then? Where once a sense of the sacred marked the landscape itself, where social order used to be visibly embedded in sacred order, architectural relics attest to a profound change: the vanishing of the supernatural from the affairs of the world, the waning power of religion to shape society at large. In landscapes and architecture, secularization has become visible. Secularization also describes the world the West has gained. In this world, culture is marked by pluralism: religious faith takes many forms, and meaning has many nonreligious sources. Even when they make their way into popular culture, supernatural notions thereby lose any sacred aura. In this world citizenship requires no religious attachment, and society sets no rules for religious conformity. Secular events shape the rhythm of public life; publicly significant religious occasions tend to lose their transcendent content. This ‘demystification of all spheres of life’ is the symptom of what Max Weber was observing in 1917, of the “disenchantment of the world”. He cites the growth of a range of contemporary spiritual practices from Yoga to Reiki, but cautions that ‘ Compared to the “real thing”—religious tradition—New Age spiritualties of life are impoverished, vague, attenuated, and quasi-spiritual, if not secular’. He makes the point that while there is frequent discussion of church attendance being in decline, other spiritualties of life are growing. There even appears a preference to be ‘spiritual’ over being religious – that being less structured speaks to the key themes of freedom in postmodern identity. Even in a postmodern experience, the consistency of human imagination and spirituality suggests that this is something deeply connected to our collective psychology. Jonathon Haidt, in his influential work on Positive-Psychology, ‘The Happiness Hypothesis’, discusses ‘Divinity with or without God’, identifying sacredness and a spiritual side of psychology as being necessary for happiness. ‘In its broadest terms, maintains that wonders and marvels have been demystified by science, spirituality has been supplanted by secularism, spontaneity has been replaced by bureaucratization, and the imagination has been subordinated to instrumental reason’. 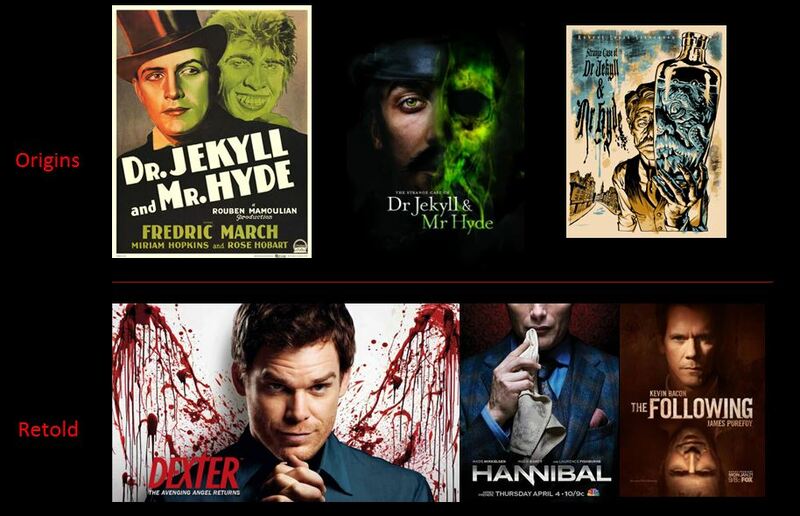 When we look at film and TV today, there is a rich canvas of science fiction and fantasy. It is possible to counter the premise of this discussion, that we are more enamoured with the marvellous and enchantment as our executional ability almost matching our most vivid creative imaginations. In the postmodern world Jean Baudrillard, has made the observation to this point that the sense of real and unreal becomes tenuous – reality collapses into hyper reality. One of the implications of the post-modernistic interpretations of culture is the fragmentation and merging of ‘high’ and ‘low’ culture into a form of ‘aesthetic popularism’. Many of the supernatural tales that we are exposed to today originate form a melange of different literary and oral sources. Frank Zipes makes the point that story telling started when were first able to speak and socially communicated stories were the vehicle. It’s useful to briefly review the role of fairy and supernatural tales that rub Richard Dawkins the wrong way. Frank Zipes illustrates that many story types: religious, patriotic, fairy tales all have more in common than differences. The exception being that fairy tales tend to be secular and are not based on a prescriptive belief system or religious codes. Fairy tales started in 1500’s as brief, secular narratives that were new in expression. Interestingly, these stories tend to incorporate poor protagonists that, in the face of trials, demonstrate the character of royal heroes. Bruno Bettelheim, makes that observation that many start with the ‘hero’ being subjugated by antagonists that think little of him and his/her abilities. They also tend to be very urban in settings. Zipes makes the observation that the fairy tale hero is often a seamstress or tailor ‘who has numerous adventures and encounters with the supernatural in pursuit of a ‘new world’ where he will be able to develop and enjoy his talents”. As an aside, it’s interesting that Harvey Cox, in the Secular City, linked secularisation with the process of urbanisation. Fairy tales often present a juxtaposition of the secular and supernatural. It is a function of stories and myths to provide us with a vehicle to overcome contradictions in society and culture. ‘…postmodern nostalgia tends to downplay the critical tendency of science fiction, preferring instead to make the recycling of older texts in the genre as the crucial a feature of the genre as any. In a cultural climate of pervasive nostalgia, it becomes difficult to separate science fiction’s critical capacity from other similarly unreal genres- science fiction, particularly on television, becomes a set of familiar tropes rather than the practice of extrapolation and cognitive estrangement from the real world’. In the last few years there has been a tendency within science fiction for writers to find a secular and mundane explanation for many of the traditional supernatural tales. Many of these tales started off as folklore and fairy tales and have become cultural phenomenon in their own right. This appears to be mirroring a postmodern attitude on the secular or mundane explanation for the supernatural. I’m not suggesting that all supernatural stories are being demystified or disenchanted on mass; the dominance of the Harry Potter franchise is proof of this (however, the very Muggle-ness of Harry’s childhood speaks to this tension of worlds). Every week Hollywood appears to produce a new TV series that involves some millennial war between Vampires, Werewolves and other magic denizens. However, it is possible to identify a new subgenre of the mundane supernatural. Since it’s a supernatural number, I’ll limit my observations to 10 examples, however, there are many more. 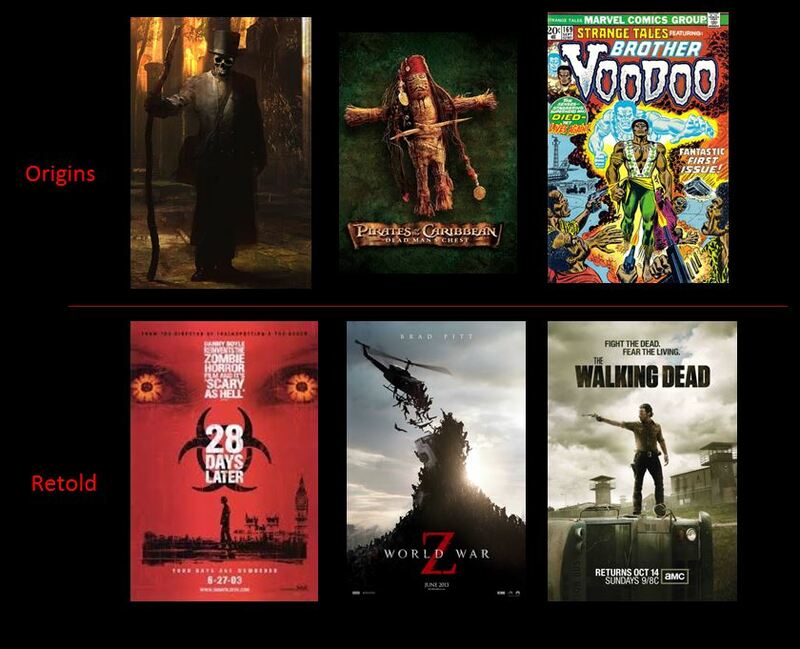 Here the Voodoo and occult origins of the zombie, withand their supernatural role originating from the enigmatic Baron Samedi, Loa and Lord of the Crossroads. In the modern frame, the secular explanation of zombies is contagion by a virus. Like many other postmodern stories, it is often man that is the cause of the viral contagion. 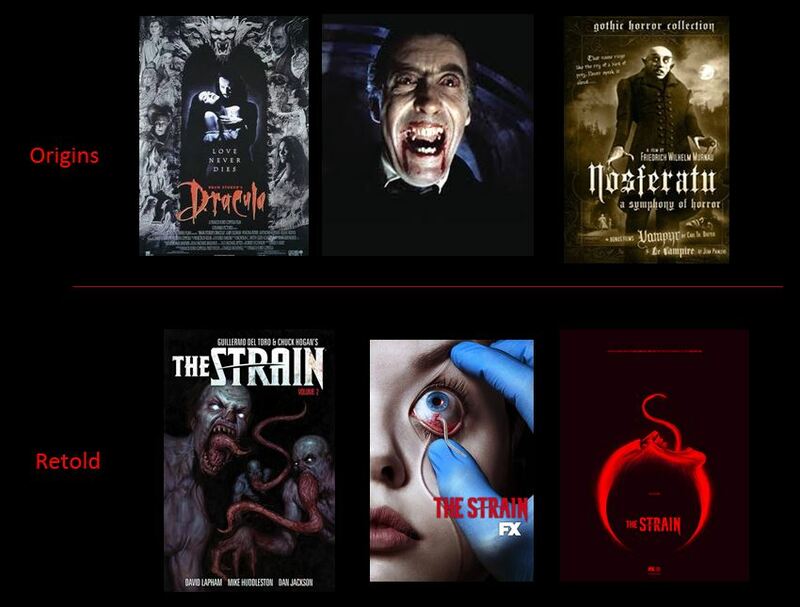 Likewise, the new TV series ‘The Strain’ explains vampires as a form of parasitic infection. This is very different from the unholy origins that Bram Stoker imagined from the original. While many of the plot elements remain similar, Chuck Hogan and Guillermo Del Toro’s approach re-imagines the reality of the vampire through a more scientific lens. 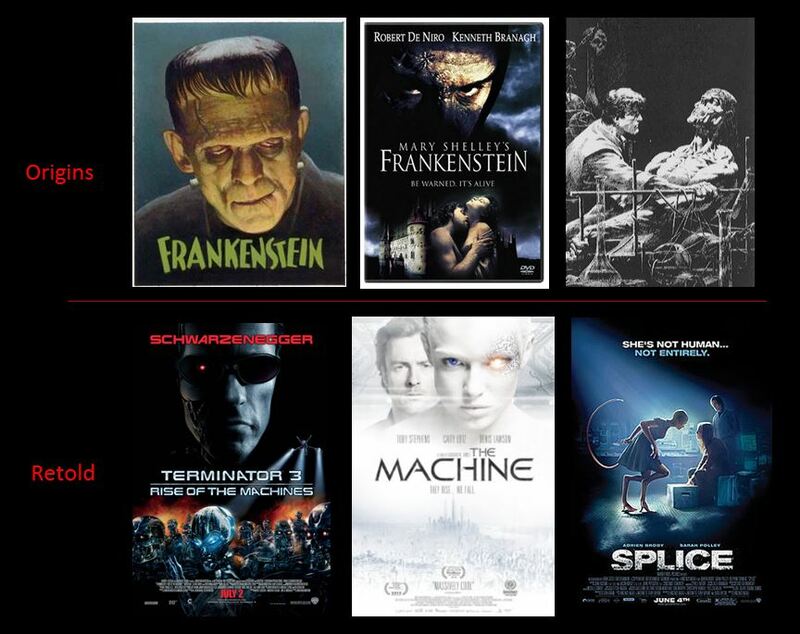 Frankenstein, as the ‘modern Prometheus’, is a story warning of many of the themes of modernity that have been discussed above. Victor Frankenstein seeks to mirror the power of God in creating Adam from death – a very supernatural theme. Prometheus in Greek myth is punished for stealing fire from the heavens; so Dr Frankenstein is punished for stealing the life force or ‘lighting’. What we tend to find in modern versions of this story is the same plot of losing control of his creations, either in the science or technology needed to create these other sentient lives. The abuse of technology by man is constant through all of these stories. 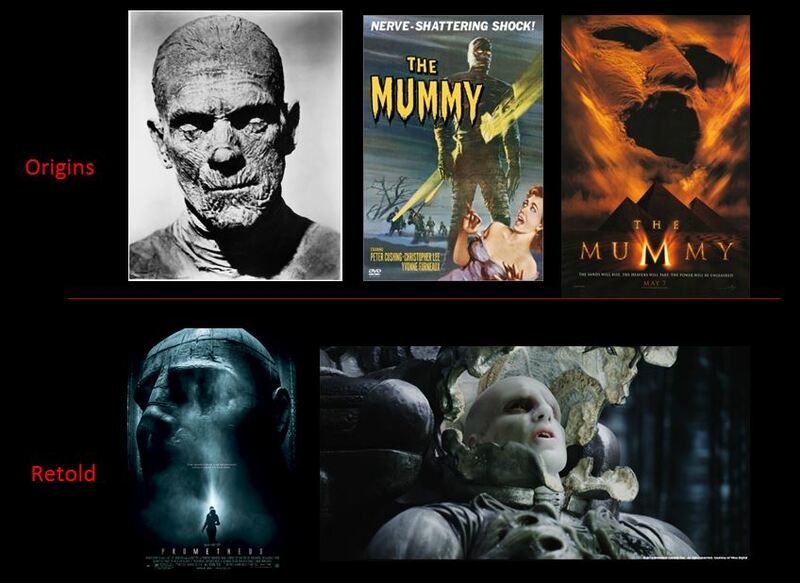 The mummy is a tricky supernatural tale to look for parallels to, since it’s specific to Egypt. The attempts in the Mummy Movie trilogy, to extend the Egyptian curse origins to China were lacklustre. However, at a plot level, the idea of an advanced race with a founding culture, monumental architecture and suspended in a ‘sarcophagus’ was central to Ridley Scott’s Prometheus as an origins story for his Alien Quadrilogy. There are several ‘mummy’s’ in this one film amongst the humans and the aliens if you think through how they travel (not wanting to totally destroy the plot). Ghost stories remain a perennial favourite, especially after Hollywood found a ready source of plots in Japanese cinema. The more secular versions of ‘ghost in the machine’ tend to be about human consciousness transferred into a computer, so that the individual lives on in the digital computer world. As with Frankenstein, this supernatural tale draws on the impact of when it was first written. I have written extensively about this theme as a ‘Doppelganger’ story in an earlier post. What we tend to see in new versions of this story is a psychological explanation for Mr Hyde. Originally it was a ‘magic potion’ that unlocked the supernatural bestial, Mr Hyde. Modern versions of these stories are inversions, where the face of evil is hidden within – the psychological face of sociopaths, psychopaths and sadists. There is an increasing trend to demystify the gods of mythology. Perhaps the show that has pushed this boundary more than most is Stargate. It started with the premise that Egyptian Gods were really technologically advanced parasitic-aliens. Then it introduced explanations for other gods in our culture, such as the Asgard, who look like many alien ‘grey men’ that are recounted in abductee stories. The Stargate series ends with a cosmic battle between a new race of omnipotent beings that have transcended our plane of reality but have ultimate power here. Their almost godlike powers are presented as being beyond known mythology. Erik Selvig: I’m talking about science, not magic. Jane Foster: Well, “magic’s just science we don’t understand yet.” Arthur C. Clarke. Erik Selvig: Who wrote science-fiction. Jane Foster: A precursor to science fact! Natasha Romanoff: These guys come from legend. They’re basically gods. Steve Rogers: There’s only one God, ma’am, and I’m pretty sure he doesn’t dress like that. If the Gods exist, then their wrath is manifest on the world. 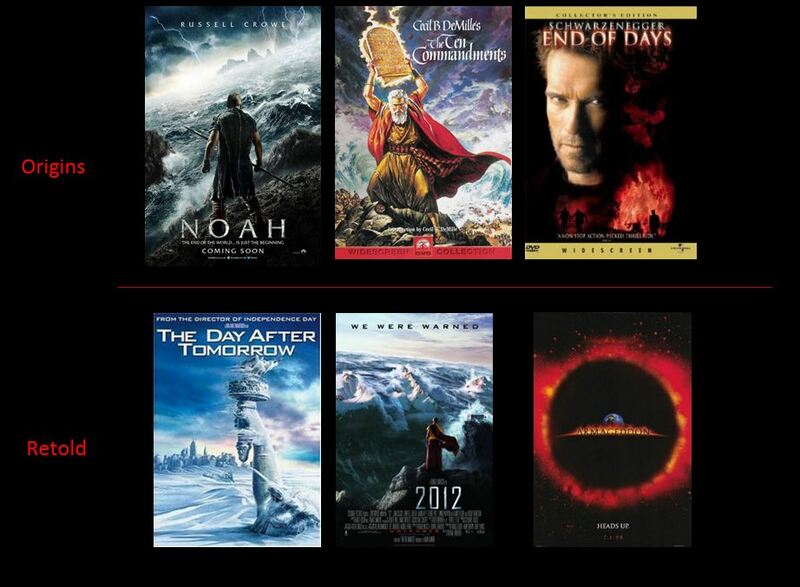 The Biblical plagues as the wrath of God are the motivations to the plot of many films with religious story lines. In the mundane versions, we see the same global implications wrought by humans on themselves through losing control of modernity. They usually revolve around variations on ‘flood’ narratives – natural events that are ‘extinction level’ events. In medieval times, stories accustomed us to the knight winning a magical sword, with which, to fight the evil of a community. These swords came from magical beings such as the ‘Lady in the Lake’ or were blessed by religions. 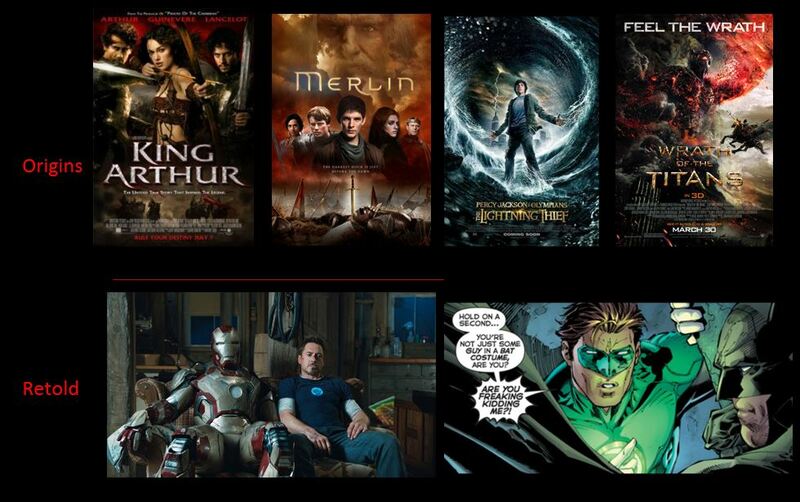 We are still telling stories that ‘god’ endorses our hero’s; these are demigods that live in both worlds. Greek gods live as half-humans or half-Olympians; King Arthur lives on Avalon the mystical isle. In modern storytelling, we don’t get bequeathed magical weapons, we ‘engineer’ them. Iron man, as the archetypal ‘tin man’ is a human construction. Batman’s powers are written in opposition to Superman’s powers, in that he trains himself to preternatural skills and augments these with technological. The tenth of these secular versions of the supernatural needs a bit of introduction since we have become distanced from these thoughts by the process of modernisation. One of the advantages in the pre-modern age was that as a ruler, you controlled history. There was collusion between the secular and religious castes to affect a belief that God had ordained a particular families coronation. This was more common in Roman and Egyptian times, where ancestry to a god was a common claim by the core aristocracy. We see a similar pattern of endorsed monarchy in Judeo-Christian times, with many aristocratic families being able to demonstrate impressive religious endorsement. If you are religious, it’s hard to argue with your ruler if God has endorsed their rule. Previously, deities bestowed their gifts and favour on individuals so they could rule. House of Cards, throws this literally on its head (and its logo). 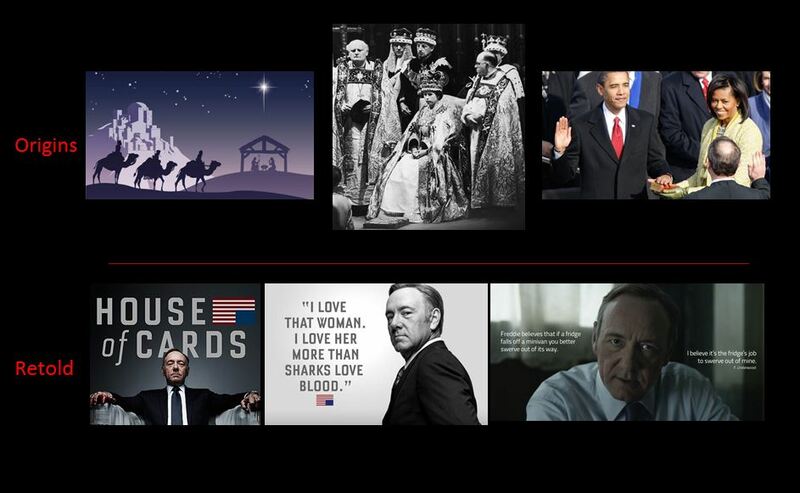 Frank Underwood is Machiavelli-on-steroids; he is secular to the bone living without apparent morality. Every action he takes is through the manipulation of his human skills. ‘Fictions become one importance source, and mass culture, as the dominant purveyor of fictions, has become a locus of enchantment equal to that of modern science. (The emergence of “science fiction” as a distinct genre in the twentieth century is emblematic of the importance of these two areas for modern enchantment. )Western elites long defined mass culture and its enchantments as inherently irrational, fit only for the childlike hoi polloi, but historians have demonstrated that elites themselves participated in mass culture because it offered enchantments that appealed to their reason as well as their imagination. Most of us have friends and associates that could be called either high and low-cultural resource individuals. It’s a generalisation, but most of the high have indulgent vices in the low; also, that many in the low admire and find aspects of high culture aspirational…just inaccessible. Most people appear to enjoy a sense of the supernatural even if the enchantments are only a momentary suspended disbelief. 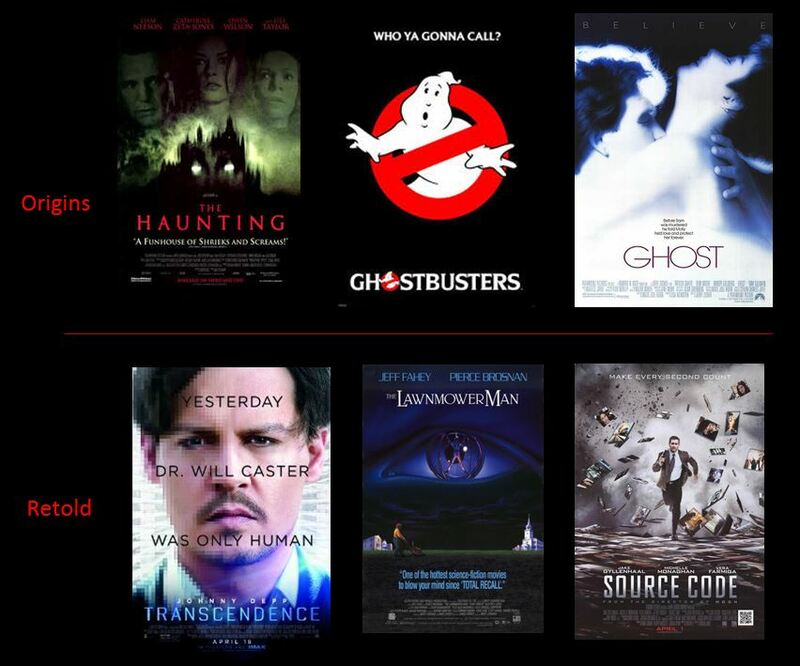 This discussion has attempted to bite off a lot of popular culture and explore the secularisation of supernatural storytelling within a postmodern frame. This has been though an analysis of current thinking on the implications of postmodern thinking and also what secularisation means within this context. Of course this sub-genre is likely to continue, perhaps a version of Rumpelstiltskin who uses a ground breaking 3D printer or Rapunzel being a victim of hypertrichosis. That we are seeking to define and understand the universe in more mundane and secular ways is evident, the question is, what do we lose? What is wrong with a bit of mystery, if we don’t project an author onto its presence? Is the issue that we are driven to want answers too much? A world without the mystery that the supernatural brings feels a big monotone, the other meaning to the word mundane is not secular but boring. Taking the super out makes the supernatural natural and familiar.